At the mere age of 15, Ran Goldblatt was making a testament to his love of maps. He stood by the fax machine two times a day. Needless to say, a career in geography was immanent, including the three degrees—a B.A., M.A., and Ph.D.—that came with it. Now, as a postdoctoral researcher at the UC San Diego School of Global Policy and Strategy (GPS), he’s no longer waiting for the murmurs of a fax to delve into his trade, but he integrates different spatial analysis techniques with advanced visualization methods to examine physical aspects of the world and data on larger scales. 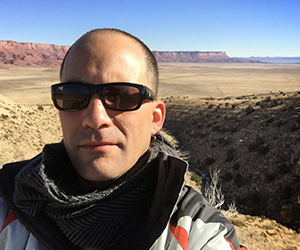 One of his most favored tools is Google Earth Engine, which on Feb. 24 he’ll be introducing to the university beyond just the Advanced Geographical Information System (GIS) Spatial Analysis course he teaches winter quarter at GPS. Free for scientists, researchers and developers, Google Earth Engine is a platform for petabyte-scale scientific analysis and visualization of geospatial datasets, combining a vast catalog of satellite imagery and geospatial data with planetary-scale analysis capabilities. The event is made possible in part through Goldblatt’s connections to the Google Earth Engine team, which he met at a conference last summer upon receiving a crash course in the platform. Clinton will detail research applications with Google Earth Engine and how it is being used in universities around the globe—Goldblatt said he hopes this also will lead to possibilities for collaborations. To that end, while he may be a new face to the GPS student he teaches Mondays and Wednesday this winter quarter, Goldblatt has been at the university for roughly two years. Now, working under Professor Gordon Hanson and teaching for the first time in the U.S., he finds himself in an environment rich of researchers whom he can lend his GIS savviness to as it relates to policymaking and urban planning, among other areas. It’s an expertise he’s honed through his research on Arab-Jewish cities in Israel as a Ph.D. candidate at Tel-Aviv University and working for many years as a GIS analyst at the Society of the Protection of Nature in Israel. With Hanson, for instance, Goldblatt is researching the relationship between industrial development and urbanization in India. Which is where Google Earth Engine comes in hand, Goldblatt said, noting on his computer it can take days to probe urbanization processes in a small city in India. But with Google Earth Engine, he can analyze the entire country in 30 minutes.